Fernando Gómez (Barcelona, 1957) is a regular contributor on history and the paranormal for numerous national media. He has published nine novels. 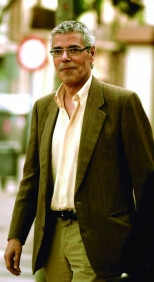 He was awarded the Mass Media Prize of the College of Private Detectives in Catalonia in 2015 for his novel Distancias Cortas, and in 2016 he was named winner of the Premio Incógnitas Oblicuas for Los vampiros de papel.